The National Weather Service issued a Tornado Warning for Santa Clara County. This included the city of Morgan Hill and Santa Cruz County. northeast at 35 mph. – * until 230 PM PST – This storm may produce quarter size hail. The first that I heard about a possible tornado was on twitter. abc7newsBayArea. I was not notified by ALERTSCC. So obviously Santa Clara County does not consider a looming tornado enough of a life altering threat to send out the town crier. I would like to ask San José Mayor Chuck Reed if we will only be alerted after the roof blows off? The season of giving is upon us, and as a board member of a local charity, I have to spread the news! Local nonprofit Second Harvest Food Bank has kicked off its annual food and fund drive. Spokesperson Lynn Crocker says they hope to surpass last year’s cash intake of $6.7 million. Between now and the middle of January, the organization hopes to raise $8 million in cash and 1.7 million pounds of food. Crocker says the economic downturn, layoffs, and high food prices have resulted in an unprecedented number of people seeking food assistance, many for the very first time. For more information about the food drive and giveaway, please visit their website. Second Harvest is one of the largest food banks in the county, but it’s not the only place people rely on for food during their holidays, so let’s spread the love! Here are a few other charities looking for some support this season, so they can keep on giving. And of course, my post wouldn’t be complete without a plug for my own charity – TurningWheels for Kids! Our San Jose-based charity raises money throughout the year to buy new bikes for local underprivileged children in Santa Clara County. Each December, our bikes are assembled by hundreds of volunteers and distributed to the kids in the community who need them most. Last year we assembled and distributed more than 2,000 bikes, and we hope to do the same this year. Bikes are important to kids for many reasons – the main two being health and responsibility. We love promoting healthy lifestyles among our youth, and we need your help! Just as other charities in the county, we’re experiencing higher costs and need more donations than normal. For more information about our charity, please visit the TurningWheels for Kids website . Our organization was built on $10 donations, and we still love them! 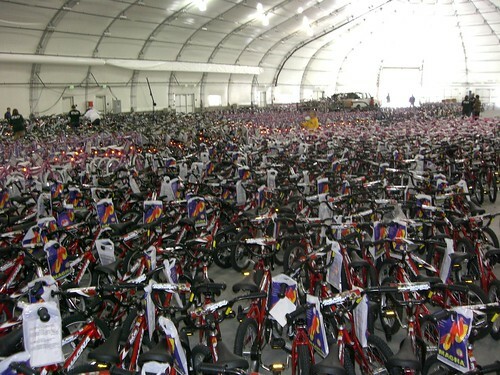 More than 2,000 bikes were assembled and distributed to children's charities just before the December holidays. TurningWheels is a local nonprofit organization that is run 100 percent by volunteers. Posted in Bay Area, Benefit, Donations, Family, News, San Jose, Silicon Valley, South Bay, Volunteer | Comments Off on The season of giving is upon us!